The Epiphany: What is it and how do people around the world celebrate? Includes five fun facts about the Feast of the Epiphany. The Epiphany is celebrated by believers around the world - but what is it? The Epiphany refers to the night of Jesus' birth, when the three wise kings pay him a visit (SpiritualDirection). LOS ANGELES, CA (Catholic Online) - Each year the Pope leads an Epiphany Mass in St. Peter's Basilica and people around the globe take part in celebrations specific to their region. In Spanish-speaking countries, The Epiphany is called Dia de los Reyes, meaning "Three Kings' Day," while in Pamplona, Spain celebrates with a Cabalgata Los Reyes Magos parade. There are several traditions and names for celebrating the Epiphany, but what is it? The Epiphany is celebrated each January 6 and is a day dedicated to the birth of Christ, which includes a nod toward the three Kings who came to visit Him. According to Dictionary.com, the word "epiphany" means "an appearance or manifestation, especially of a deity." Appearance is correct, as Christ revealed himself in the form of a newborn babe to the Three Wise Men, who traveled from their countries to pay tribute to the Son of God. It is also a reference to the baptism of Christ by John the Baptist. The six Sundays following Epiphany are known as the time of manifestation. 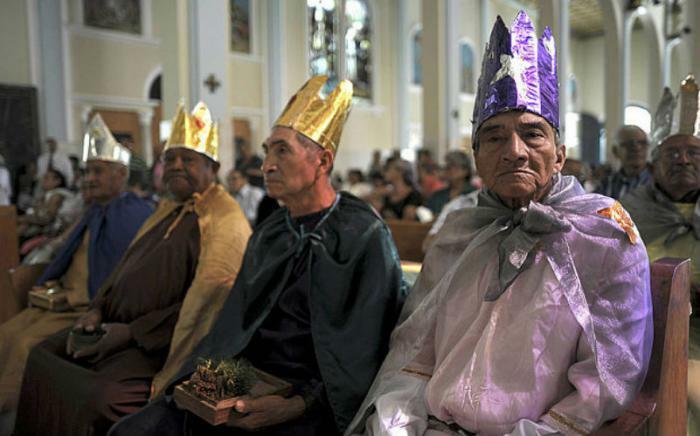 Men in San Salvador dress as the Wise Men for Epiphany celebrations (Getty Images). The Gospel of Matthew describes three Wise Men, named Melchior, Caspar and Balthazar, who were told of Christ's birth and set off, following the Star of Bethlehem, to meet the baby Jesus. Each king brought with him gifts of gold, frankincense and myrrh to represent Jesus' elevated position, divine birth and mortality respectively. Historically, Christmas was celebrated each day from Christmas Eve to the Epiphany, with January 6 being as large a celebration as December 25. Though Protestant churches celebrate a season of Epiphany from January 6 to Ash Wednesday, the Catholic Church observes Epiphany as a single day, with some in America celebrating the Epiphany feast the Sunday following January 6. In Spain, children believe their Christmas presents are delivered by the Three Wise Men on January 6, while in Venice, children believe "La Befana," an imaginary old woman in Italian folklore, brings gifts to them on the Epiphany Day. Star Singers in Germany offer to bless your home (Pinterest). 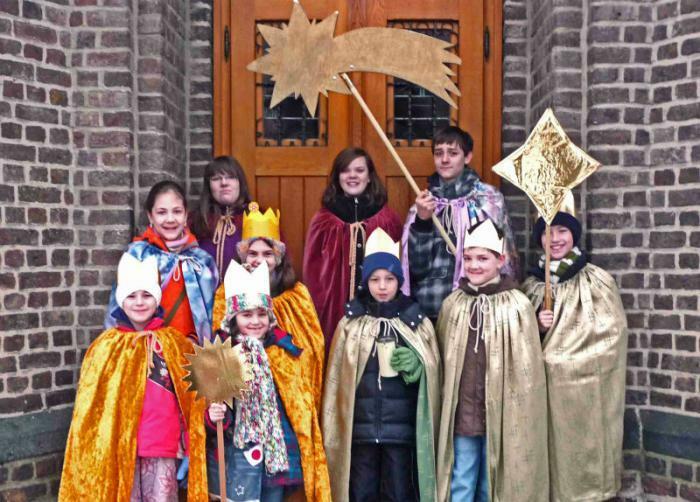 An old Catholic tradition is the Star Singers, which ar groups of people who dress as the Wise Men and carry a wooden star who go door-to-door to sing and collect donations for the poor. In Germany, if the Star Singers (Sternsinger) come to your door, they offer a blessing for your home. If you accept, they write 20 * C + M + B + 14 in chalk above your doorway. The numbers represent the year and the letters represent the phrase Chrustus mansionem benedictat, meaning "God bless this house." In Bulgaria it is traditional for an Eastern Orthodox priest to throw a cross in a river. It is believed whoever recovers the cross will be healthy through the rest of the year, as will any who join in a dance within the river's frigid waters. Mexico makes King's bread, called Rosca de Reyes, which has a circular shape and is decorated with figs, cherries or dried and candied fruits. In Spain, the King's bread includes baking a Jesus figurine and a bean into the bread. Whoever discovers the figurine is crowned king or queen of the celebration, while the person who discovers the bean must pay for the following year's Epiphany party. Now that you know what Epiphany is, and have several ideas of how to celebrate, enjoy Epiphany by honoring the birth of Christ and the presence of the Three Wise Men.